Crab meat is low in fat and rich in protein and contains very little mercury, so it's safe for pregnant women to eat. Popular New England crab cakes are traditionally made by deep-frying the crab meat patties, but broiling instead helps reduce the fat content for a healthier entree. One 60 g crab cake contains 93 calories, 12 g of protein, 4.5 g of fat and 90 mg of cholesterol. Combine the crab meat and a starch of your choice in a large mixing bowl. Starches could include breadcrumbs, dried bread pieces, crushed up crackers or cooked mashed potatoes. Gradually add liquid to the mixture until it is moist enough to form into cakes. While mayonnaise and butter are common moistening elements, they are both heavy on the fat. Substitute egg whites, low-fat milk or low-fat mayo instead. Mix in the yolk of one egg for heavier cakes, or the white of one egg beaten until it forms soft peaks for a lighter, fluffier cake. Mix in any flavoring elements, such as mustard, Worcestershire sauce, finely chopped onions or celery, seafood seasoning, fresh herbs or lemon juice. Form the mixture into 1/2-inch-thick patties. Form the cakes gently and don't compact the mixture, as the cakes will become very dense. Dip each cake in breadcrumbs if you want the outside to be extra crispy. Place the cakes on a greased broiling pan and refrigerate for 30 minutes. Chilling the cakes allows them to bind properly so they stay together during cooking and serving. Preheat your broiler. Place the broiling pan 5 to 6 inches beneath the heat element and broil the cakes for eight to 10 minutes on each side, or until the breadcrumbs are golden brown. 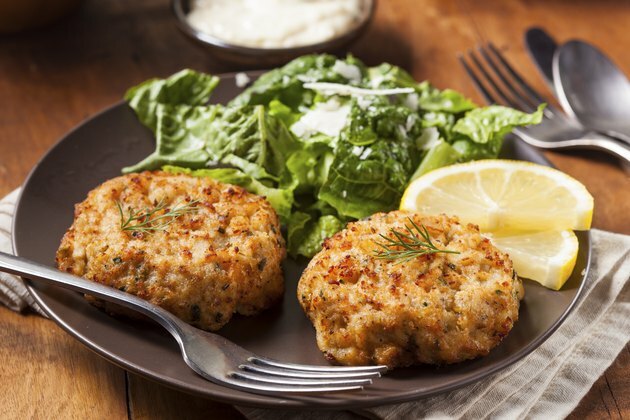 Serve crab cakes as is with a slice of lemon or with a cream sauce. Stack a crab cake with sliced vegetables on a whole wheat bun for a healthy sandwich. If the breadcrumbs are not sticking to the cakes, dip them in a beaten egg first. Pregnant women should limit seafood consumption to 12 oz. per week. MayoClinic.com: Pregnancy and Fish -- What's Safe to Eat? How Many Calories Are in Crab Cakes?